With its high smoke point of 460 degrees Fahrenheit, this pure olive oil is an excellent all-purpose oil for your commercial kitchen! 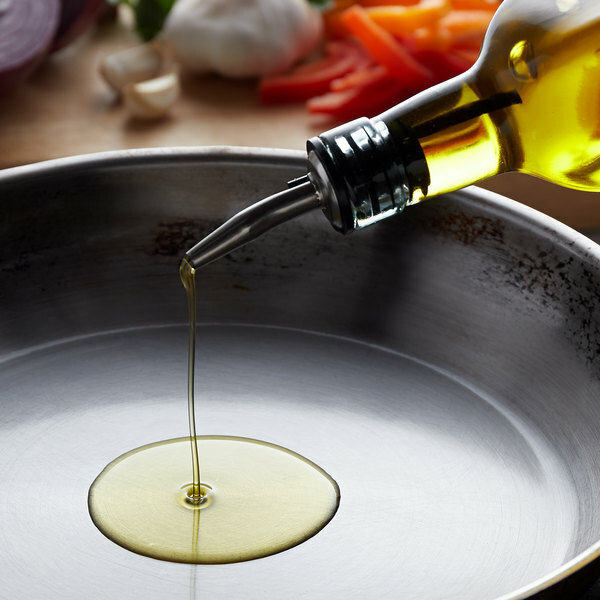 Because the smoke point of olive oil varies with quality, this oil has a higher smoke point than a more refined olive oil and pomace oil for optimum versatility. Use it for stir-frying vegetables, sauteing, or creating marinades. This pure olive oil is made from hand-picked olives that first-pressed for the highest quality and purity. It has a low acidity and mild olive flavor that naturally enhances the taste of your pizzas, soups, and meats. Serve it as a dipping sauce with bread at the start of the meal, or use it in baking. It has a delicate taste and slightly lighter color than extra virgin olive oil, which helps bring out the flavors in your foods rather than overpower them. Whether you're whisking salad dressings or finishing pastas, your customers are sure to love the taste of this pure olive oil! This was an excellent product, great quality, price, and convenient bulk amount. The flavor is light and not overly strong - and lends itself nicely to frying, baking, salads, etc. I am due to reorder soon. I needed an abundant amount of olive oil for a catering gig i had. The taste is alright as long as you don’t use to much of it. I think this is a high quality and affordable olive oil. It is a whole gallon and comes in a nice metal tin. It has a handle on top and pour spout. The only thing is it is kind of hard to pour and not make a mess, but I just put it in a smaller container and refill that when necessary. Decent olive oil but not the best. Will not rebuy this item however as I do not enjoy the flavor of the oil. Tastes cheap. It good olive oil it can be used on salads it taste like olives it feels smooth and looks yellow and shiny and it taste good. Great quality. After having issues with a consistent olive oil, we switched to the Lira oil and haven't looked back. We would highly recommend this product to others. YUM! Super flavorful olive oil! We dipped bread in it last night and it was perfect! I highly recommend! Would be great for cooking too! This is a great everyday olive oil. it is definitely loaded with a very nice olive flavor. If you like flavorful olive oil, you will love this. Even though this isn't a virgin olive oil, it still has amazing flavor and looks very smooth. Easy pour spout and fits nicely in most kitchen cabinets. We use this olive oil for kneading dough and for baking, in applications where Extra Virgin is not needed. This olive oil is a great value and perfect for our uses! 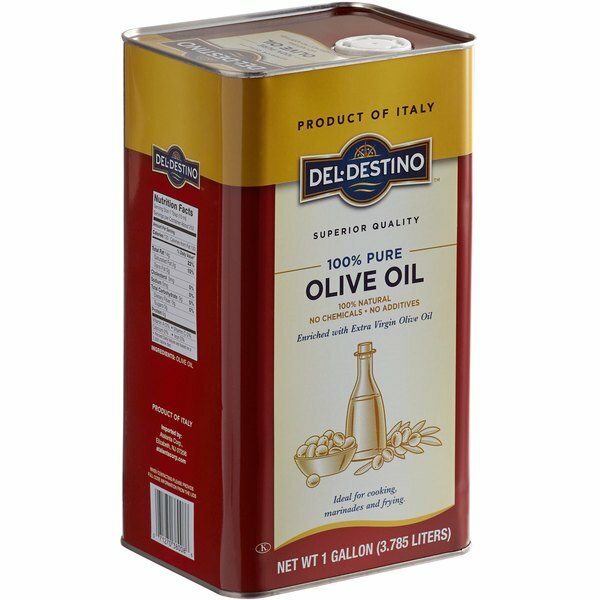 A nice gallon tin of pure olive oil that is perfect for sautéing our vegetables. The oil is great tasting and has a nice neutral flavor. Great oil for making soap, which is what I buy it for. Good quality for the price and much more cost effective for soap making than the extra virgin, which I believe is overkill for soap. Will buy again. Sir Clean recommended this product 100% Pure Olive Oil - 1 Gallon, we love to use in different kind of food, the flavor is delicious. The price is good. My family loves thi healthy olive oil in many food dishes. I love the tin container as well as the quality and size and amount that lasts awhile. I really like this olive oil. It is exactly what I need, and is a great value for 1 gallon. I like the tin that it comes in, as well.